Don’t fret. While you could easily spend months exploring everything Greece has to offer, most of us don’t have the luxury of that much vacation time. I’ve done the hard part for you and created a customized itinerary that hits the best of the mainland and the islands. Here’s my guide to one week in Greece. My general advice? Spend a day or two in Athens to soak up some history and then head out to the Cyclades. The places I’ve chosen are all accessible by ferry, but since ferry schedules tend to be a little hard to coordinate (sometimes they only run from certain islands on certain days), I recommend taking an Adventure Cruise so all the details are sorted out for you. You can rest assured that you’re in the hands of an experienced captain and crew while you’re on the ship, and of two local leaders when you’re on shore. The Parthenon and other ruins in the Acropolis. If you’re only in Greece’s capital city for a day, you’re going to want to see the highlights. 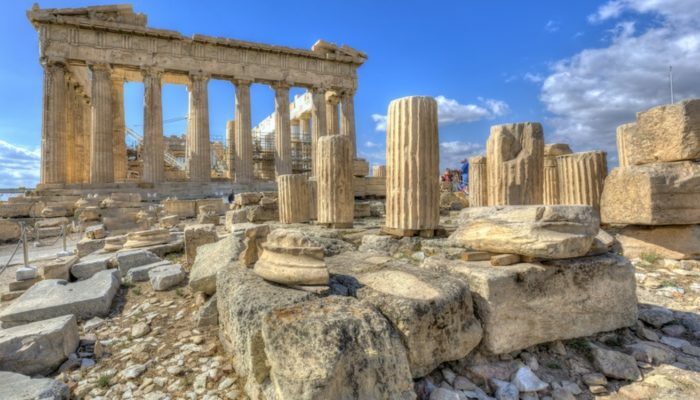 The Acropolis, which includes the Parthenon, the Theatre of Dionysus and the Temple of Athena, is a must-see. But be sure to visit in the morning to avoid the hottest sun and the biggest crowds. When the sun does get too hot, head to the Acropolis Museum to see all the artefacts that were found in and around the Acropolis (and to enjoy some air conditioning). In the afternoon, I suggest exploring Syntagma square (the site of the Greek parliament), the Monastiraki flea market, and the Plaka tourist district. Or if you’re looking for a guided tour, you can’t go wrong with our sister company, Urban Adventures’ day tours. For dinner, head to Yiasemi, an adorable family-run restaurant that provides welcome respite from the tourist crowds and tasty meze-style meals. The islands of Sifnos (and one of its idyllic beaches). Arrive early to enjoy the island of Sifnos before the crowds arrive. This island is famed for its pottery and for its cuisine cooked in said clay pots, so be sure to do some pottery shopping (and eating!) while you’re there. If you’re lucky (or on a Peregrine Adventure Cruise), you might get the opportunity to meet with an artist in their pottery studio and see how the pots are made in the traditional way. When the afternoon sun hits, relax with an espresso freddo at one of the many beach-side tavernas or hit the glittering, white-sand beach. Two Peregrine travellers admiring the view in Oia, Santorini. It was the first thing our local leaders told us about Santorini. I’m not particularly at ease around livestock, and no one has ever mistaken me for the pious type, but that last part won me over. 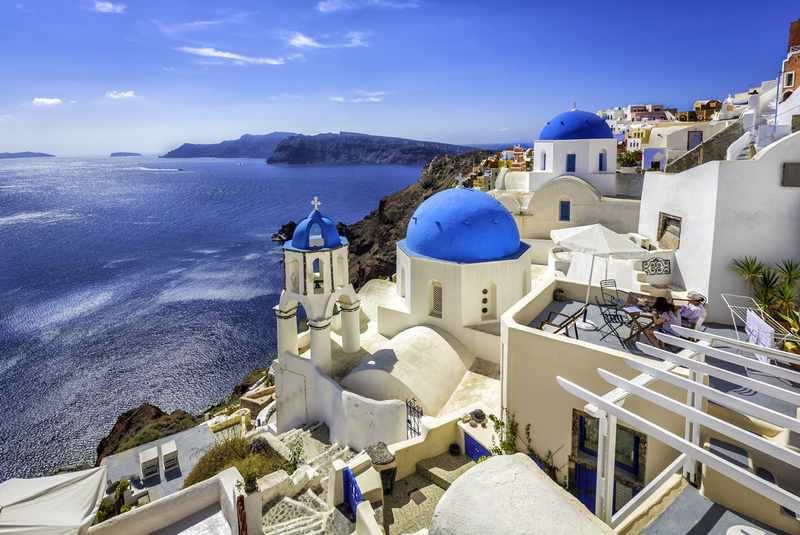 Although Santorini can get extremely busy, the picture-perfect views and the ample wine makes it a must-see. Arrive early to explore the village of Oia without the crowds. Take the opportunity to get a photo with the iconic blue domes and white houses you probably picture when you think of Greece. Then head to the other side of the island to explore the Akrotiri archaeological site. These fascinating ruins of a Minoan Bronze Age settlement will take you back to a time before ancient Greece and have you marvelling at how advanced their civilization was. End your day anywhere that offers the aforementioned wine and views of the Caldera. The Monastery of Hozoviotissa on Amorgos. 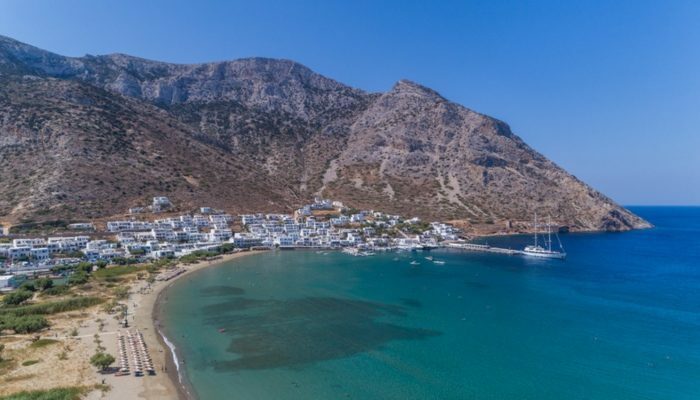 Amorgos is the easternmost island in the Cyclades, meaning that most tourists won’t make it all the way out here. It’s home to the iconic Monastery of Hozoviotissa (Monastery of the Virgin Mary), which is built into the face of a cliff. 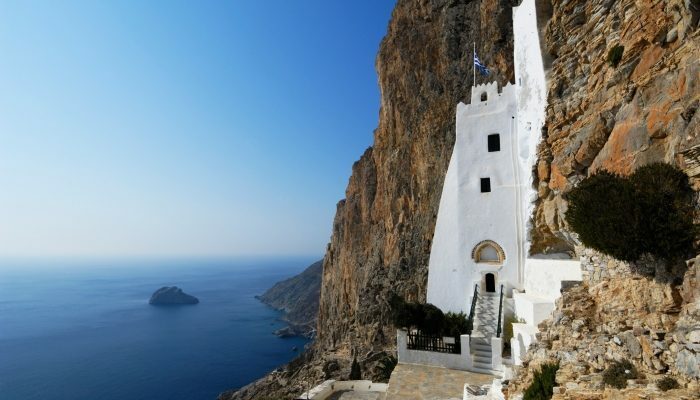 For a bit of exercise and sweeping views of the Aegean Sea, take a hike up to the monastery. After your hike, cool down with a swim on pristine Aegialis Beach. The harbour in Parikia, the capital of Paros. 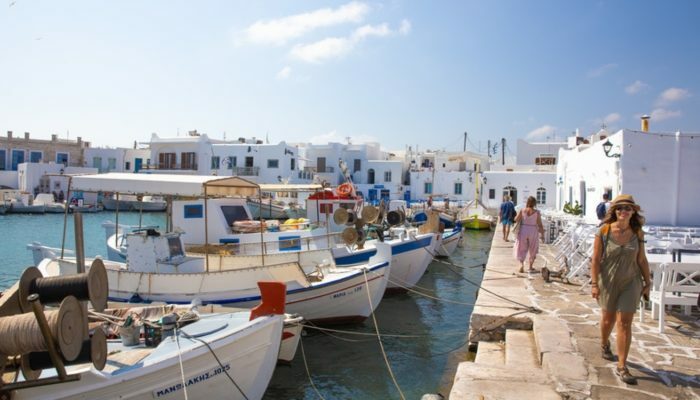 It seems silly to give any sort of itinerary for Paros because seemingly everywhere you turn is filled with chic boutiques, charming alleyways, ancient churches and bustling beach bars. You cannot go wrong simply wandering around the island. But if you’re looking for specific advice, take in the classical Cycladic architecture as you explore the villages of Naoussa, Parikia and Lefkes. And be sure to stop in at the Ekatontapyliani, the Byzantine complex sometimes known as The Church of 100 Doors. Then head to the beach to enjoy the crystal clear waters and gentle waves. 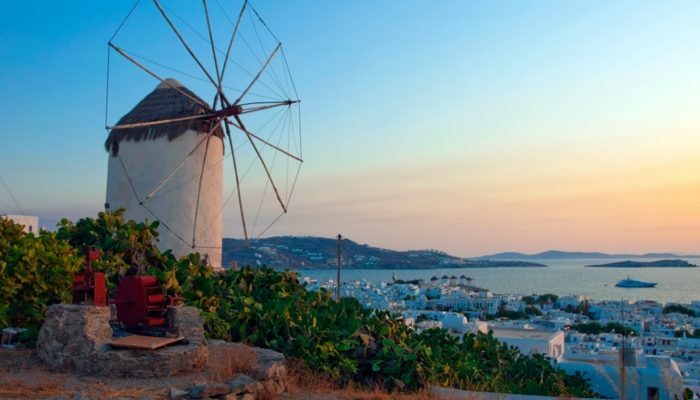 Mykonos is perhaps only second to Santorini in terms of fame, but it comes first in the hearts of the glitterati and those looking for all-night parties. If that doesn’t describe you – don’t worry – it doesn’t describe me either; you can still find plenty of things to do on Mykonos. This windy island is home to mazes of traditional Greek alleyways and sun-drenched beaches in addition to the hottest bars and restaurants. It’s also the jumping off point for Delos – the sacred island that is the mythical birthplace of Apollo and Aphrodite. No one is allowed to stay overnight (mythology dictates that no mortal may live or die here), but there are daily boats to and from the town of Hora. Delos is one of the most important archaeological sites in Greece, and especially if you are not one for the dusk till dawn parties of Mykonos, it is not to be missed. 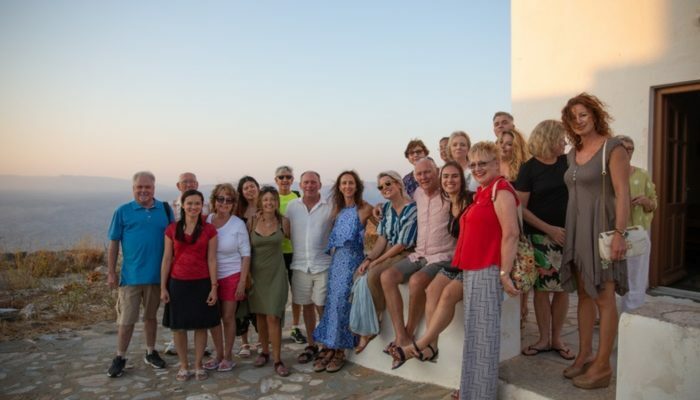 My whole Peregrine tour group in San Michalis, Syros. Start your morning in Syros with a walk up to one of the highest points on the island, the old town of Ano Syros. The town has two mountain peaks to choose from – one topped with a Catholic Church and the other Greek Orthodox, both offering incredible views of the town and the harbour below. After your walk, enjoy a meal (and perhaps a beer; you earned it) at one of the many tavernas on your way back down the hill. Just know, as soon as your food comes, you may be surrounded by the infamous stray cats of Syros begging for a bite to eat. In the afternoon, most of the restaurants and shops close down, so do as the locals do and take a nap! If you’re not feeling sleepy, you can walk through the historic marble squares or relax on yet another beautiful beach. Lastly, return to Athens knowing you’ve soaked up some of the best Greece has to offer (and probably a little sun too). Ready to plan your adventure through Greece? Explore all our Greece tours. A full-time copywriter and part-time traveller, Christina is based in Toronto where she works on Peregrine’s marketing team. 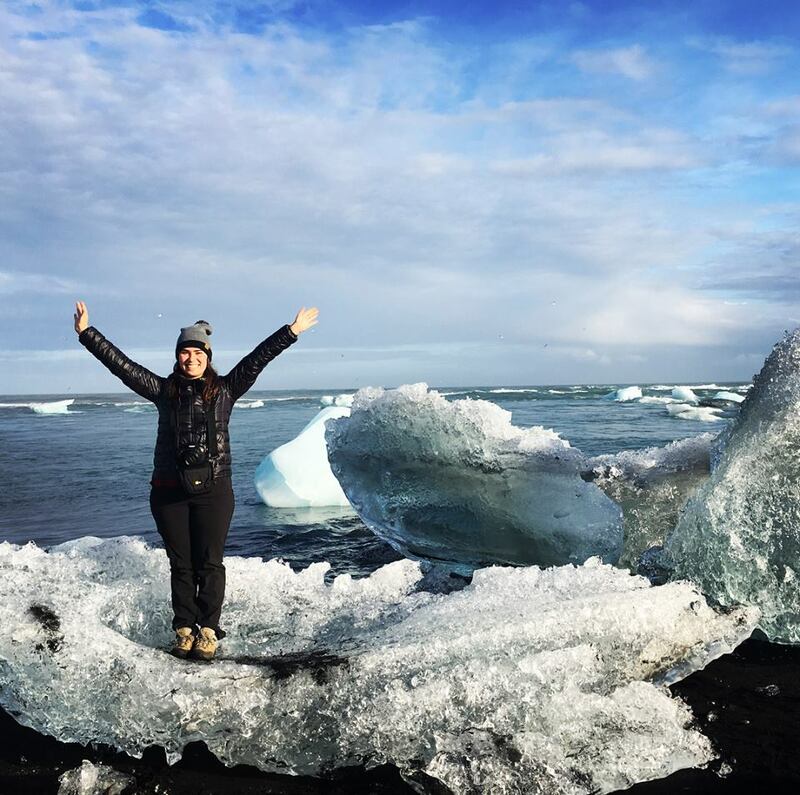 After a trip to Ecuador and the Galapagos Islands completely changed her perspective on travel, she decided to see as much of the world as she could. She considers herself an opportunistic traveller and goes wherever work opportunities and affordable flights may take her.